I was in a mood recently, casting about for what to read next, wallowing in indecision. Let's face it fellow readers, at any given time our to-be-read piles threaten to topple over and crush us. So I decided to step back a few decades, and I grabbed my Library of America American Noir of the 1950's. I realized, not for the first time, that I'd never read Patricia Highsmith's classic The Talented Mr. Ripley. What's interesting about American Noir of the 1950's, is that the editor elected to follow Jim Thompson's The Killer Inside Me with Highsmith's Ripley novel. Back to back, these might be illuminating reads, offering insight to the evolution of the genre. The protagonists of both novels are murderers, and the suspense in both cases derives from the protagonists constant fear that their acts have been detected by the authorities. Much has been debated (and re-debated, and re-re-debated) on the subject of the sympathetic vs. unsympathetic protagonist. In both of the above novels, the authors work some kind of magic that puts us on the side of the murderers, hoping they can escape the clutches of the law. The unsympathetic protagonist is a subject near and dear to my heart. Although I've been blessed with mostly good reviews, I've had my share of e-mail (some of it surprisingly angry) which criticizes Charlie Swift (Gun Monkeys) for being a killer or dismisses Conner Samson (Suicide Squeeze) for being a loser, etc. I have always maintained that these characters are not aware that there are readers watching their every move, and so they feel no compunction to clean up their acts and act "nice" for an audience. I've always wanted to write about (and read about) characters who show us all sides of their makeup, warts and all. 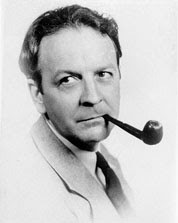 The actions of Thompson's protagonist ultimately catch up with him, and "justice" is served. With some possible irony to flavor the climax, since it turns out the murder victim is, in fact, still alive after all. But in Highsmith's tale, Ripley gets away with his murders, living to kill and forge and swindle another day. Having read so many reviews and criticisms of so many different novels that insist on a protagonist being "likable" it's difficult to imagine a modern audience taking a shine to Tom Ripley. He's cold, manipulative, and mostly detached from the rest of humanity. He is self-serving and self-centered. His definition of the good life is suspect. While I might not be attracted to Tom Ripley as a person, I am very attracted to him as a character. Kudos to Highsmith. I'm just sorry it took me so long to read this classic. Now, wouldn't this lovely book make a great gift for the special people in your life? In interviews, authors are often asked what sort of atmosphere they need when writing. Some authors need silence. Others play music. I might be in the minority on this, but I usually have a movie going in the DVD machine. A dead quiet office is disturbing to me for some reason, and I find myself singing along to music. A good film, one I've already seen several times, seems the best ticket for me. I pop in the movie, look up from time to time at the screen, and then go back to pecking away at the keyboard. I am probably the victim of a media-saturated society. As an adult, I should be able to sit quietly and concentrate on my work, but I find utter and complete silence uncomfortable. Yesterday, I locked myself in my office to put in some hard work on Bad Alchemy. As usual, I put a film into the DVD player. The theme of the day, quite by accident, turned out to be the royal military. The first film was Zulu, the bayonet and spear flick which first introduced Michael Caine to the world. The overt attraction of this film is the non-stop stabbing and shooting. A small contingent of British soldiers hold their ground against an overwhelming Zulu force. More subtle is the gentle commentary on class and imperialism which one need not particularly notice in order to enjoy the film. My wife tricked me into presenting an absolutely terrible paper on this film at an academic conference ... but that's another story. 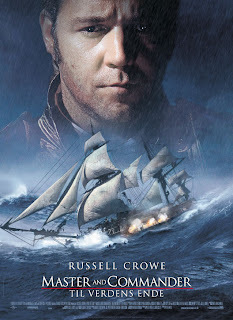 The second film in the stiff upper lip double feature was Master and Commander: The Far Side of the World. Proper English gentleman running sabers through French sailors. 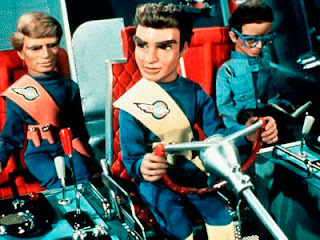 There was far less in the way of subtext, compared to Zulu, but he nautical cannon blasting death action was top notch. Last weekend's movie was Lost in Translation. Next weekend? Who knows? Bring on the city-smashing monsters. I think I'm hip to see the film Cloverfield. I've been debating with myself. As a kid I loved it whenever Godzilla smashed up Tokyo. But iIdidn't want to go to the theater and be tricked into actually seeing some dumb waste of time (When the film Independence Day came out I thought "cool" when I saw the previews, but I actually found the film pretty lame.) But now THIS GUY has endorsed Cloverfield. Looks like I need to get into a popcorn mood. GO-GO LOVE ... Thanks, Professor Fury! 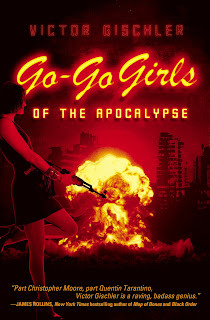 Professory Fury over at Pretty Fakes has some great things to say about Go-Go Girls of the Apocalypse. Thanks to Mike Cane for the heads up. People were generous this year, and I got some nifty stuff. But the most interesting present had to be the first edition copy of Raymond Chandler's The Little Sister. Thanks to my mother and step-father for this thoughtful gift. Hope everyone is having a spiffy New Year. 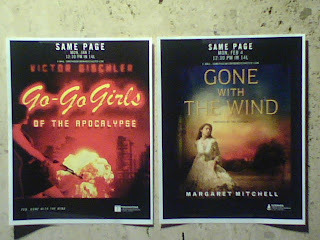 It seems that Same Page, Simon & Schuster's in-house book club, has made Go-Go Girls of the Apocalypse it's January pick. This is a great honor and a big, wet New Year's kiss on the lips to the folks at Simon & Schuster for choosing my book to spend some time with out of the thousands they publish. You guys are extra-nifty. And what's the club pick for February? Gone With The Wind. Me and Margaret Mitchell. Two peas in a pod.